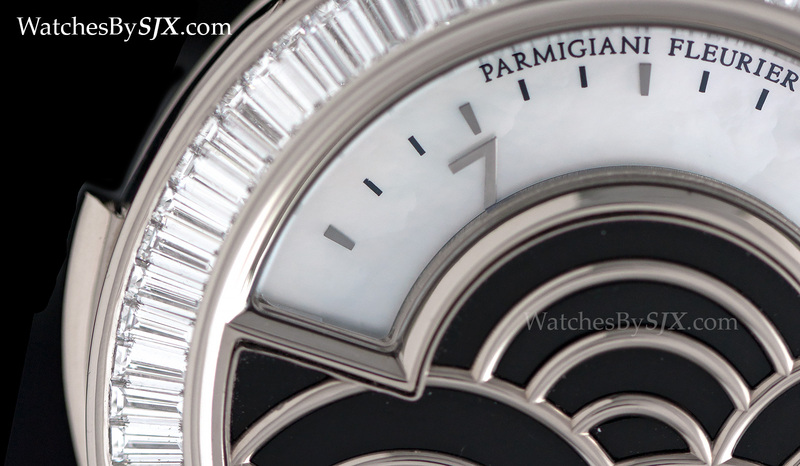 Parmigiani’s house style tends towards elaborate case and dials combined with beautiful movements, exemplified by several one-of-a-kind timepieces unveiled this year. 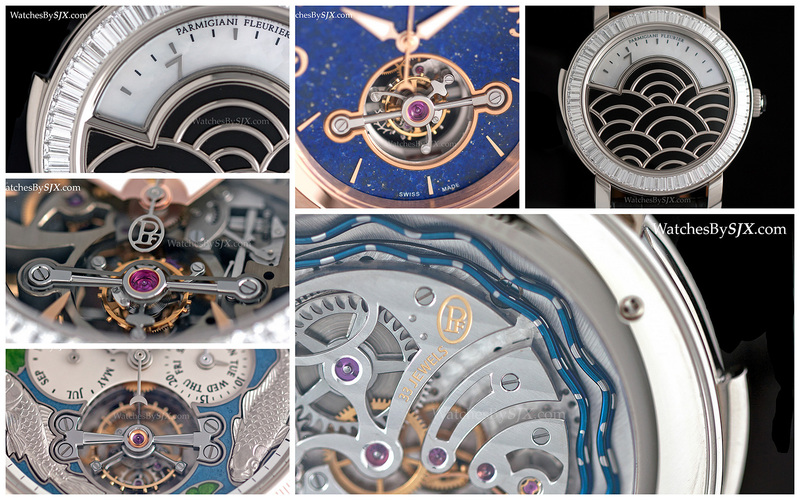 Unique, complicated timepieces took pride of place in Parmigiani‘s 2015 line-up at SIHH 2015, all boasting wonderfully executed movements and lavishly appointed cases. 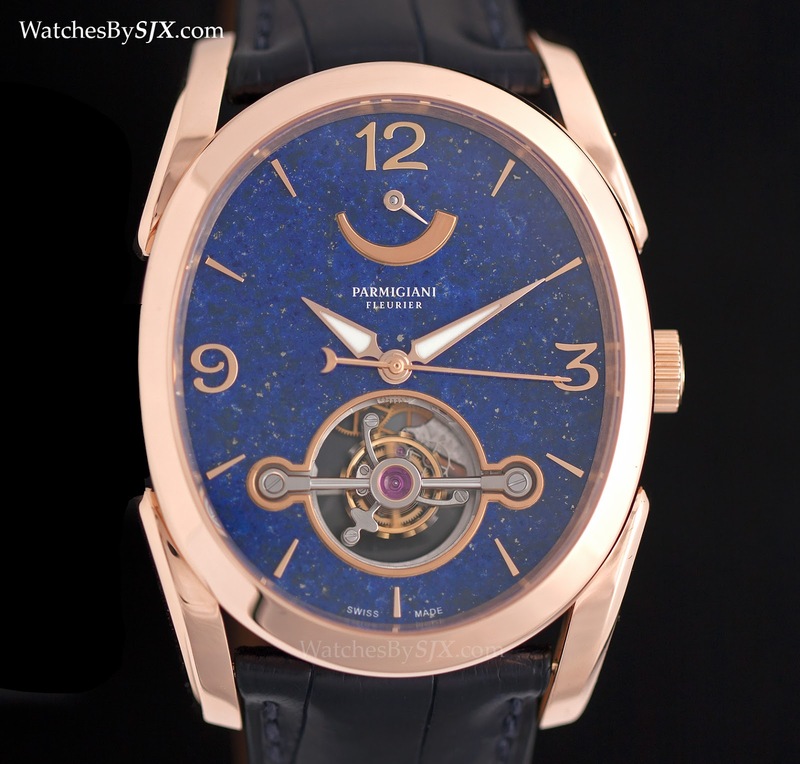 The brand is owned by a wealthy charitable foundation, and its sister companies make dials, cases and movements, giving Parmigiani a wide-ranging and well funded manufacturing ability evident in its watches. 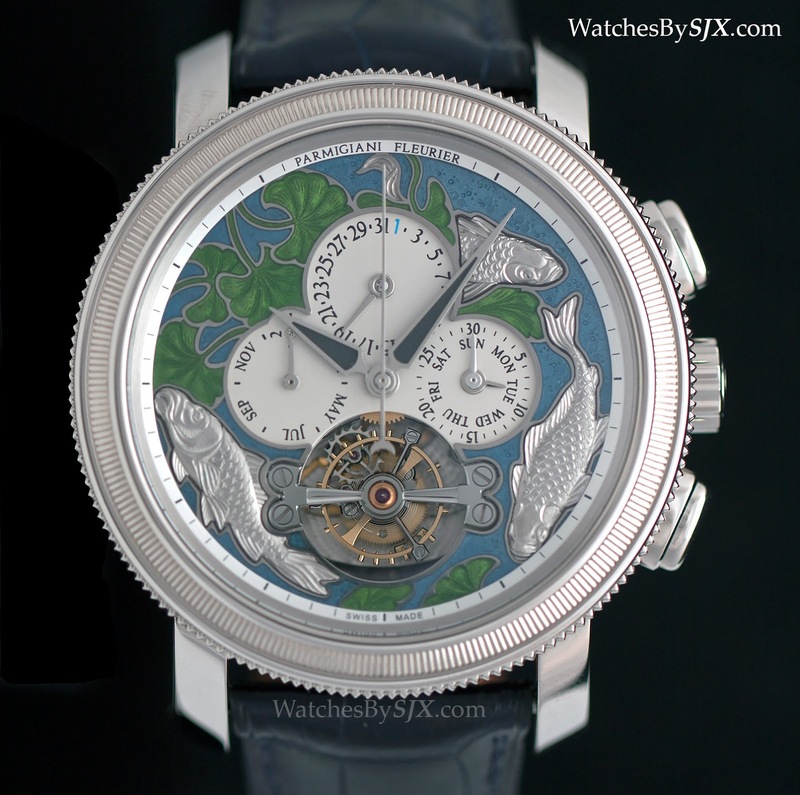 Take for example the Toric Capitole Wave, a minute repeater with wandering hours time display. 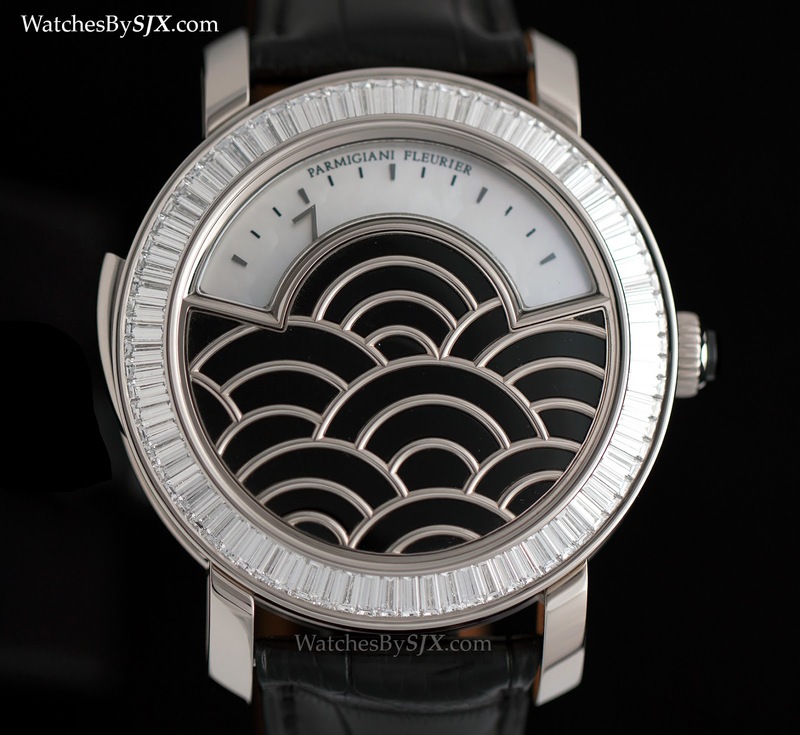 The dial for the wondering hours is mother of pearl, while the front plate is inlaid with black onyx in a wave motif, and circled with baguette diamonds. 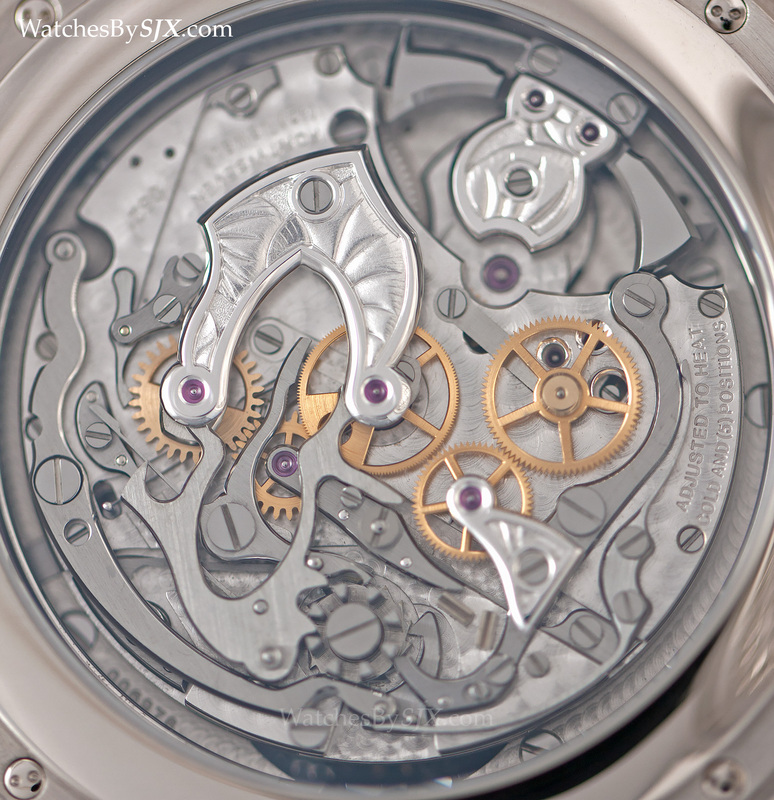 The movement is intriguing, featuring “serpent” cathedral gongs for the repeater. These are formed in a wavy shape, with alternating blue and silver stripes, created by painting lacquer in stripes, heat bluing the gongs, and then polishing off the lacquer. Only one piece will be made in white gold, with another in rose gold, each being a unique piece. Both have 45 mm cases. 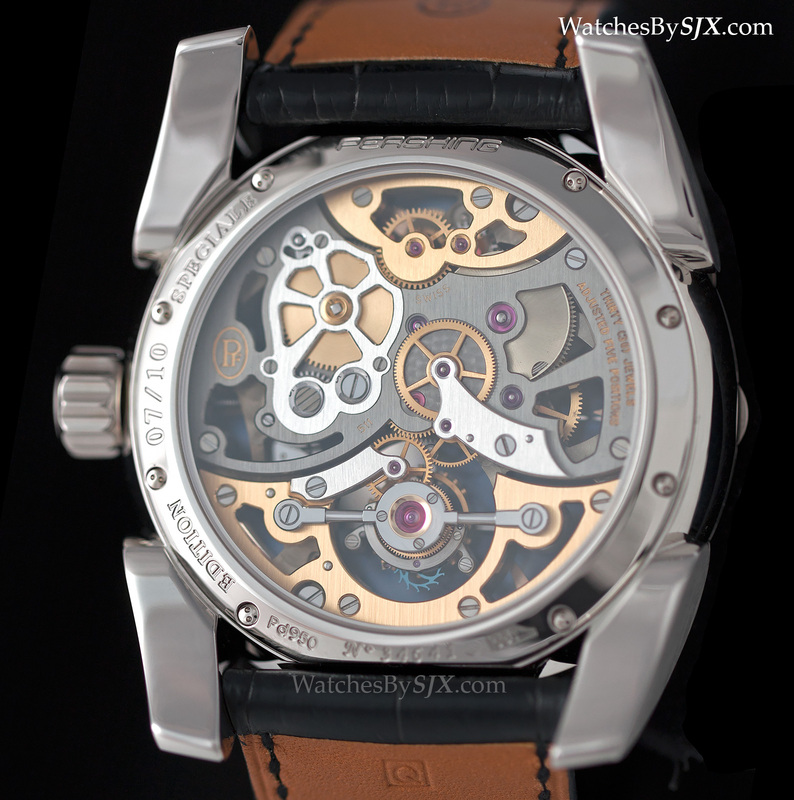 Also a unique piece is the Tecnica “Les Carpes De Sandoz”, a minute repeater with chronograph and perpetual calendar. 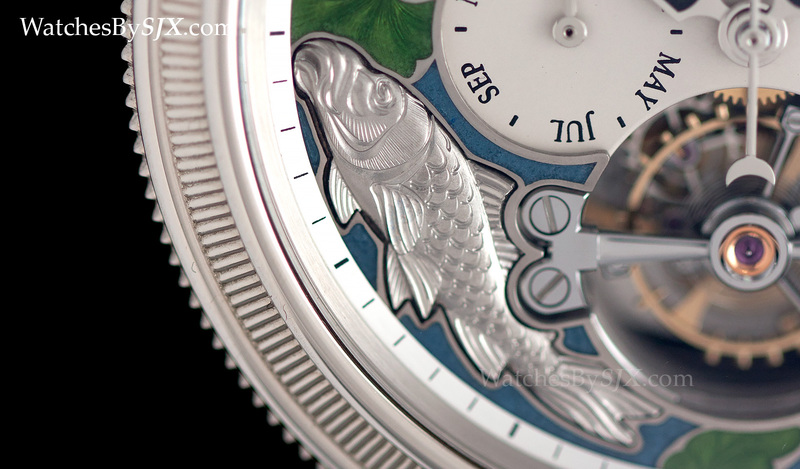 The dial is a disc of solid gold decorated with blue and green enamel, and inlaid with three hand-engraved, solid gold carp inserts. 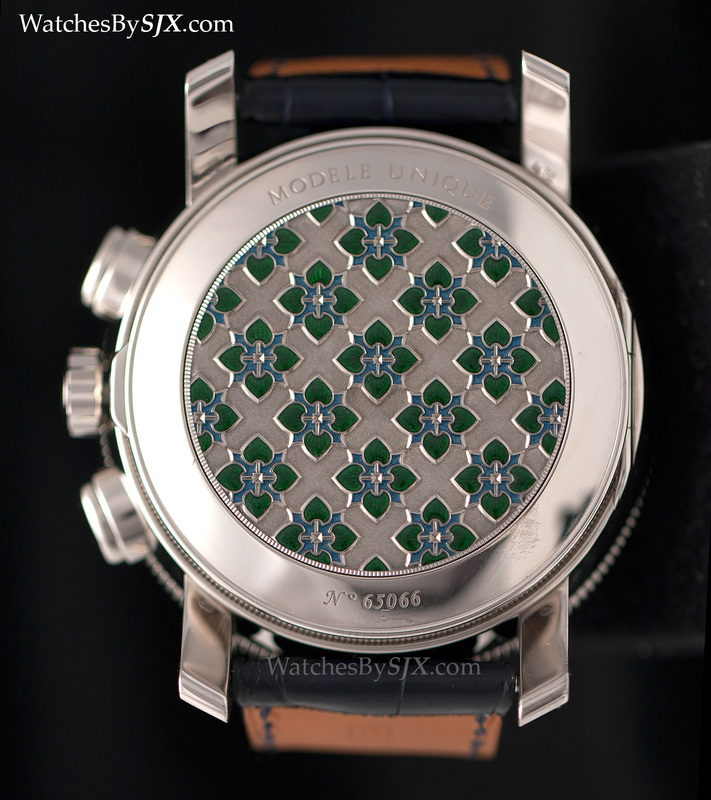 Similarly engraved and enamelled, the hunter case back pops open to reveal a movement also decorated in a similar style. 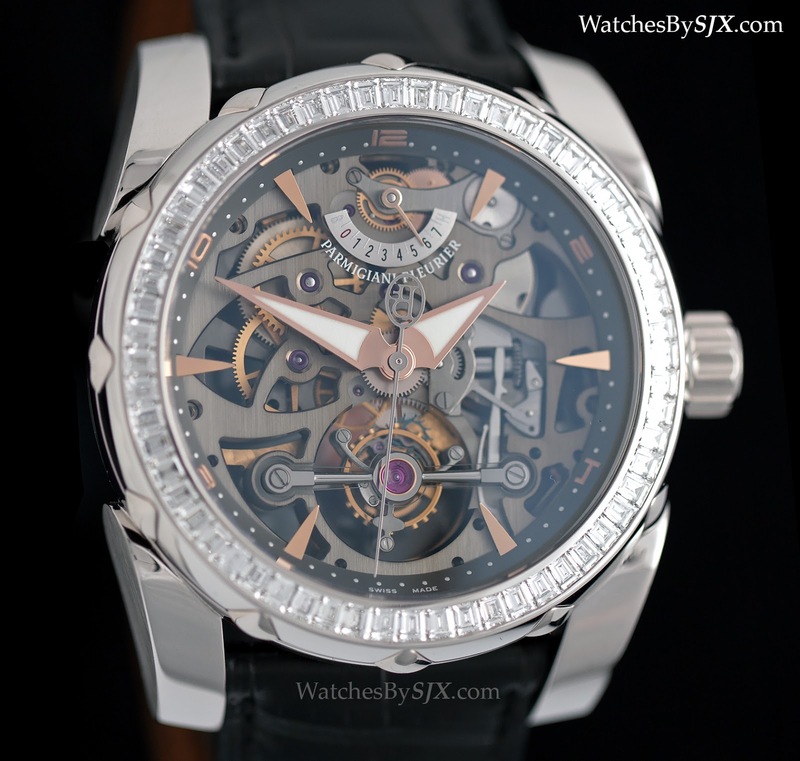 The white gold case is 46.7 mm in diameter and 16.82 mm high, making this a very large watch. 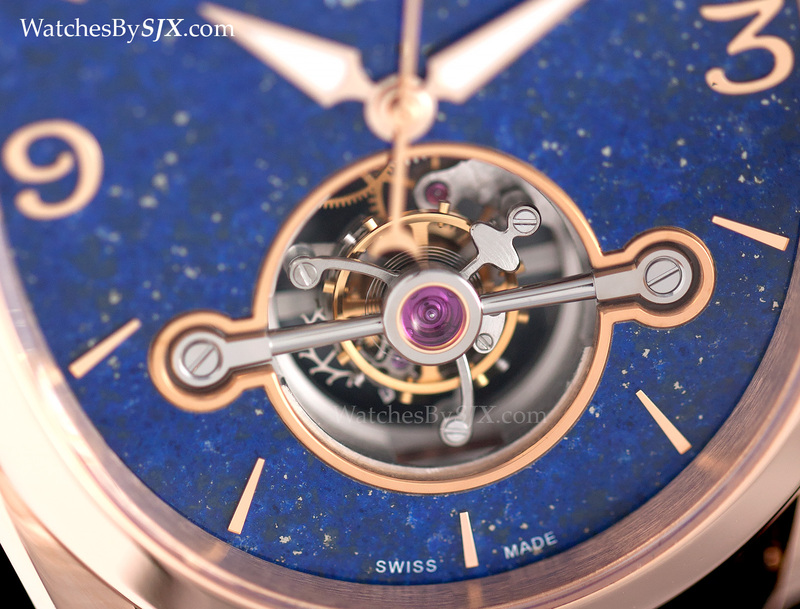 The Ovale Tourbillon Lapis Lazuli has a dial made of a thin, polished slice of lapis lazuli, with the tourbillon visible at six o’clock. Unusually the tourbillon makes one rotation every 30 seconds, making its rate of rotation twice as fast as the conventional one minute tourbillon. 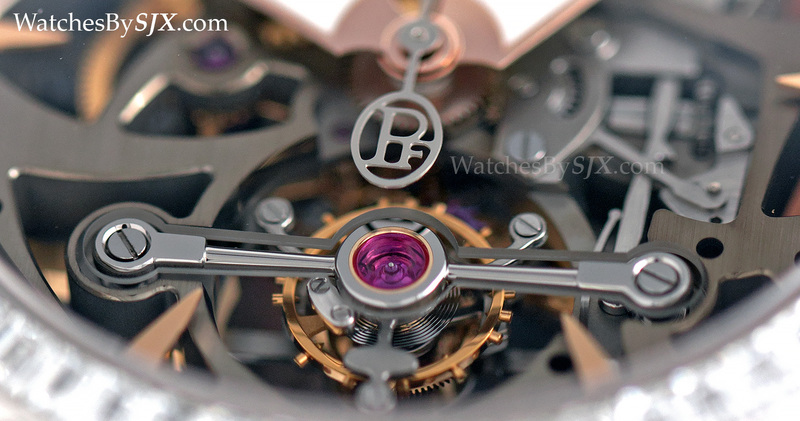 Equally compelling is the view of the back of the eight-day power reserve movement. 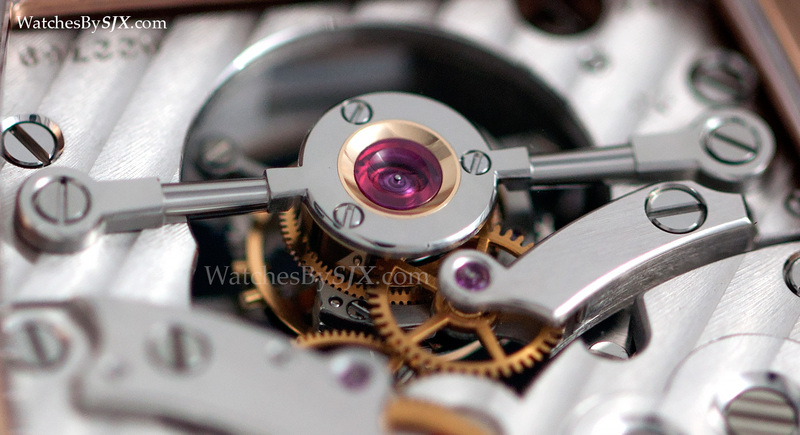 The bridges are beautifully shaped and finished; notice that the tourbillon has a black polished steel bridge on the front as well as the back. 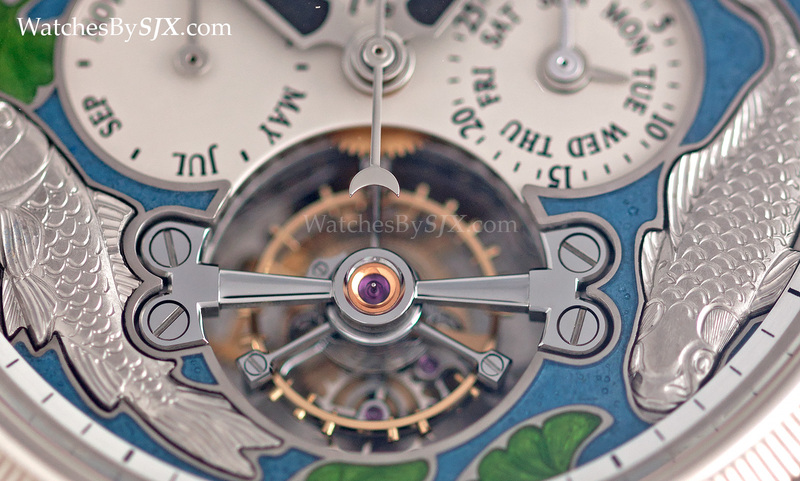 As is Parmigiani’s habit, the Ovale Tourbillon is large, the case is rose gold and measures 45 mm long by 37.6 mm wide. 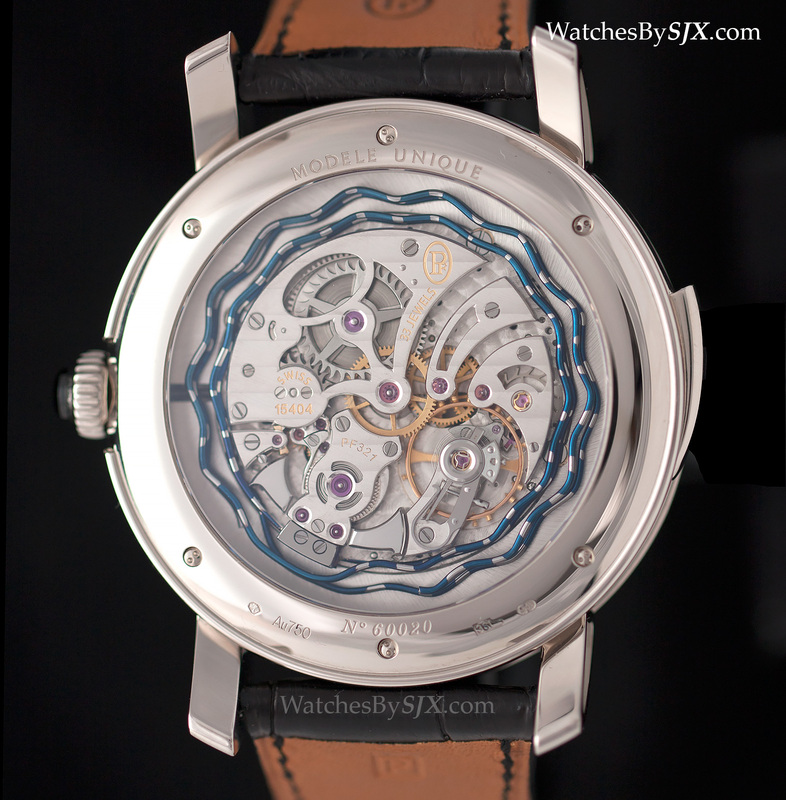 Equipped with another version of movement found in the Ovale, the Pershing Tourbillon Openworked is a skeleton tourbillon inside a chunky, diver’s watch case. 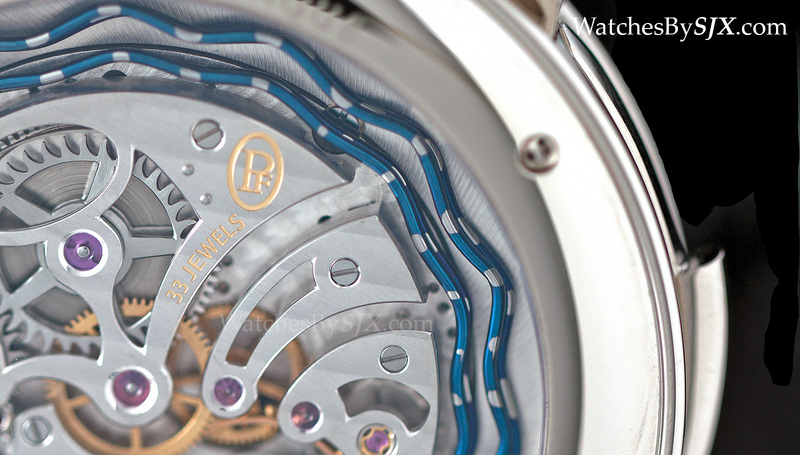 Named after the maker of high-end boats, the Pershing is Parmigiani’s line of sports watches. 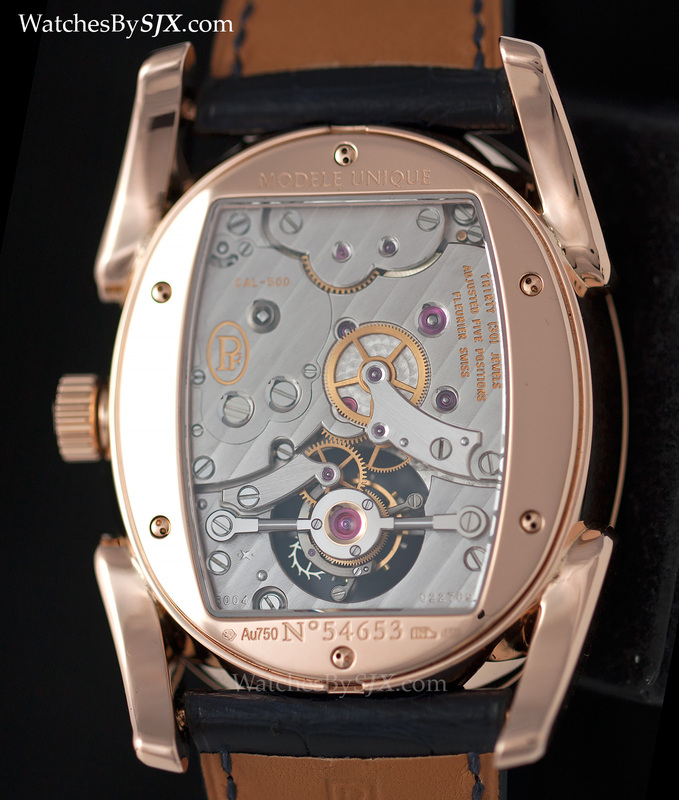 Seen from the back the movement has alternating grey PVD coated and gilded bridges, giving it a surprising but attractive aesthetic. The case is made of palladium, from the same family of metals as platinum, giving it the same bright white sheen and density. 10 pieces will be made with a baguette diamond set bezel, 30 without diamonds, and another 30 in rose gold.